Eleanor Castro, 76, was taking a shower at her home in West, Texas, when a massive explosion a mile and half away spun her around and knocked out power in her house. Investigators have located the spot where the horrific Central Texas fertilizer plant explosion occurred but do not yet know what triggered the deadly blast, town officials said Sunday. West, Texas, fire officials said at a news briefing that there is no evidence of criminal activity in last Wednesday's massive explosion at the West Fertilizer Co., and that there are no longer any fires burning at or around the decimated facility. The blast rocked the town of West just before 8 p.m. local time Wednesday. At least 14 were killed, 200 injured, and scores of nearby homes and businesses damaged or destroyed in one of the worst American industrial accidents in years. A fire official announced the city has identified the “seat" -- origin -- of the explosion, but did not specify the exact site. “We do have a large crater,” Assistant State Fire Marshal Kelly Kistner said. Fire officials also announced plans for a memorial service at Baylor University in Waco, Tex., on Thursday, in honor of the volunteer firefighters who died in the explosion. “It hits close to home for us all,” said Joe Ondrasek, an executive board member of the Texas Line of Duty Task Force. At Sunday's briefing, officials read statements by some of the families who lost loved ones. Wendy Norris, director of the Texas line of duty death task force, read a statement on behalf of the family of brothers Doug and Robert Snokhous, recalling the volunteer firefighters' close bond. “They were always together, and we were comforted that they were together in the end,” she said. Five volunteer firefighters and four emergency services workers are among the dead, Sgt. Jason Reyes Reyes said on Friday. 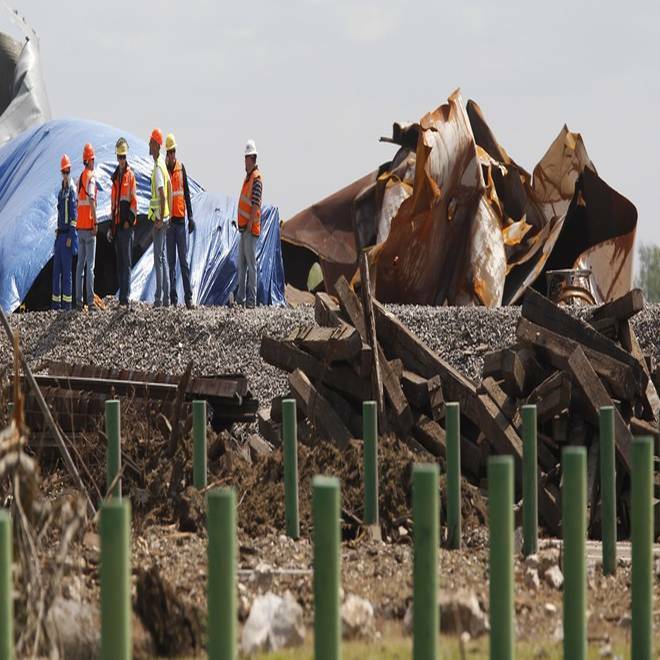 Workers stand amid debris Sunday, four days after an explosion at a fertilizer plant in West, Texas. killed 14 people and injured 200 others. NBC News' Marian Smith, Elizabeth Chuck and Becky Bratu contributed to this report.